This is a clear interference in the internal affairs of Venezuela. Who is the United States to tell the Venezuelan people how to interpret the new situation? The White House promotes the same narrative that the opposition in Venezuela is pushing. What right does the United States have to impose themselves, along with their few allies in Latin America and an international organization, as a mediator in Venezuela? Her full article provides us with an excellent orientation for analyzing events. As far as Venezuela is concerned, the U.S. and its allies in that country have been waging a relentless economic war combined with media terrorism against the Bolivarian Revolution and President Nicolás Maduro. In addition, the collapse of international oil prices on which Venezuela depends but beyond its control, fed into the economic war. The goal of the U.S. in the last year or so was to clear the path for the opposition to win the legislative elections on December 6, 2015. Yes, there are weaknesses in the Bolivarian Revolution, everyone recognizes it, including the Maduro government. It is striving to take action in conjunction with the people at the base. However, the combined economic and media war orchestrated by Washington was the main reason for the December 6 defeat. The hand of Washington is exposed if one takes into account the interference by the U.S. in Venezuelan elections before the December 6, 2015 and in the context of its Latin American policy. Click here to see the book cover. The December 6, 2015 election is not the first time that Latin American and Caribbean countries have been the target of the Obama administration. In 2009, right after Obama’s coming to power, the Honduras coup took place with Washington’s full involvement. The role of the Honduran military, armed and trained by the U.S., became notorious for its violent suppression of the Hondurans, who struggled for months on end against what the grass roots called a dictatorship. “MR. VENTRELL: …And we said yesterday, a full recount would be important, prudent, and necessary in ensuring that an evenly divided Venezuelan electorate is confident that the election meets their democratic aspirations…. QUESTION [from a journalist]: Well, okay. So are you prepared to congratulate Mr. Maduro on his victory? MR. VENTRELL: We’re not there. QUESTION: Why? The vote has been certified. He has been elected. So either you say, “Okay, and we’ll work with you,” or, “try to work with you,” or you say, “We don’t think that you’re the real winner”, or, “We think that there is no winner because the vote hasn’t been certified,” so — I mean, are you prepared to work with President Maduro, President-Elect Maduro? “…María Elena Salinas: I have two more questions. One is does the U.S. recognize Nicolás Maduro as the legitimate President of Venezuela? Obama went even further than his own administration by implicitly proclaiming the Venezuelan election as being illegitimate. In addition, by completely ignoring the CELAC position taken only a few days earlier, Obama de facto claimed that the “entire hemisphere” is composed of only the U.S. and Canada! By Googling for the repercussions from this interview right after it was made public, it was immediately found in over 50 entries in Spanish “Obama habló de Venezuela: ‘El hemisferio completo está viendo la violencia y los ataques a la oposición’” (the entire hemisphere has been watching the violence, the protests, the crackdowns on the opposition). “…QUESTION [from a journalist]: I’d like to ask if you have any comment about the violent protest that took place yesterday there and the lack of coverage provided by the local TV. And also, this morning the Venezuelan foreign minister in an interview blamed an opposition politician, Leopoldo López, for violence that took place yesterday and said that López and his acolytes have been financed by the U.S. Government for a long time. If you please have a comment on those two points, I would appreciate it. “…QUESTION [from a journalist]: So the government accused Washington of being involved in these — the [Venezuelan] protests. MS. HARF: It’s not true. It’s not true. QUESTION: They didn’t accuse you? MS. HARF: No. We are not involved in them. MS. HARF: They may have accused us; we’re not involved in them. MS. HARF: Are you talking about Mr. López? We are particularly alarmed by reports that the Venezuelan government has arrested or detained scores of anti-government protestors and issued an arrest warrant for opposition leader Leopoldo López. These actions have a chilling effect on citizens’ rights to express their grievances peacefully. On February 17, the then Venezuelan Foreign Minister Elías Jaua disclosed in a press conference in Caracas that the Venezuelan ambassador to the OAS, Roy Chaderton, had received a telephone call from a State Department official. According to the Venezuelans, the U.S. is “asking” the Maduro government for “a series of conditions” and threatened Venezuela with “international consequences” if opposition leader Leopoldo López were to be arrested. Elías Jaua also revealed proof indicating that Washington has been directly involved in training the violent groups. How can Obama say that the accusations against U.S. diplomats for interfering in the internal affairs of Venezuela are false? The above three-sentence statement exclusively on Venezuela uttered by the U.S. president consists in itself an arrogant attempt to interfere in Venezuela’s internal affairs. The “legitimate grievances” of the Venezuelan people were addressed by the Bolivarian Revolution in numerous ballot box contests since December 1998. These electoral gains precisely target the U.S.-dominated economic and political system existing from 1958 to 1998. The voting included at that time the April 14, 2013, presidential election won by Nicolás Maduro and which the U.S. refused to recognize; by negating the results recognized by the whole continent, Washington had planted the seeds of the current violence carried out by the pro-U.S. elements in the country. The candidates of the Bolivarian Revolution’s Partido Socialista Unido de Venezuela (PSUV) also won the majority of municipalities, mayoralties and the popular vote in the December 8, 2013, municipal elections. Furthermore, who is Obama to declare that the U.S.-dominated Organization of American States (OAS) is the reference point for Venezuela, while the Community of Latin American and Caribbean States (CELA) is not considered? CELAC excludes two of the three countries represented at the above-cited press conference in Mexico: Canada and the U.S. They are omitted because of the historical role in the south played especially by the U.S., but also Canada, as gendarmes and plunderers of natural resources. Moreover, by what right does the U.S. define the vandals and their leader Leopoldo López as “protesters” and representatives of the “Venezuelan people,” as if they have no history of U.S.-driven violent coup attempts against the Hugo Chávez and Maduro legitimate governments? Does Venezuela not have the right to arrest and put on trial individuals who have been responsible for the violence? Obama urges “all parties” to “restrain violence.” He thus places the perpetrators of violence on the same footing as those who are trying to calm the situation, restore order and protect public and private property as well as lives from the vandals. Furthermore, by calling for “real dialogue,” he thus condemns the government for failing to consider grievances while painting a picture of the “protesters” as innocent victims of the Maduro government. 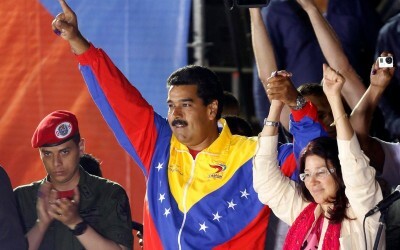 However, despite the provocations, Maduro was calling for dialogue with the opponents. This “opposition promotion” is part of the U.S. plan to create a pretext for a coup d’état in that oil-rich country. The role of the media in turning truth on its head and thus invent excuses for intervention in Venezuela is pointed out in an article by Professor Steve Ellner (who, since 1977, has taught at the Universidad de Oriente in Puerto La Cruz, Venezuela). Despite the combined forces of the oligarchy’s international and local Venezuelan media, as well as the U.S.-financed and inspired democracy promotion groups, the first battle was won by Venezuela’s participatory democracy. On February 18, the Bolivarian Revolution, led by its government and Nicolás Maduro, displayed a show of force. A massive demonstration was held by mainly oil-industry workers in Caracas. This sector has been the source of forces to overthrow the legitimate constitutional regime and open up a path for the re-colonization of Venezuela. This demonstration temporarily put the pro-U.S. forces in Venezuela on the defensive. It is only because the people are empowered and are effectively part of political power that this momentary victory and other subsequent ones are able to take place. These successful inroads into the pro-U.S. imperialist camp came about because of Venezuela’s new experiments in participatory democracy under way since Hugo Chávez won the election in December 1998. Thus, on April 19, the day after the Chavista counter-offensive, the situation was relatively calm. However, to counter the February 18 victory and the ensuing relative order prevailing on February 19, it was no accident that Obama came to the rescue. The above-quoted statement by Obama on February 19 encouraged Washington’s allies in Venezuela to restart their violent activities in Venezuela and create a climate of chaos. Thus, the next day, on February 20, violent incidents erupted once again, inflamed by Washington’s support, in various parts of Venezuela. On-the-spot reporting by “Venezuelanalysis.com” testifies to the nature of the violent opposition protests and the growing desire at the grass roots to take the streets back from the perpetrators of violence; others deftly analyze the proponents of violent regime change. The U.S. and their Venezuelan powerful media allies are blaming the Venezuelan government for the violence in that country, while it is the so-called “pro-democracy” groups that are in fact causing the rampage and disturbances. The U.S. expansionist goals toward Latin America and the Caribbean go all the way back to the last quarter of the 18th century. U.S. mainstream political parties, now known as Republicans and Democrats, have always been involved in direct and indirect military intervention in Latin America and the Caribbean; in fact, the Democrats actually scored better than their Republican with more — not less — military interventions. The arrogant interference in Venezuela by Washington and its allies constitutes the latest example from among the long list of U.S. presidents who adopt and actively sponsor the original 17th- century evangelical notion: the Thirteen Colonies and then the U.S. constitute a chosen people, the beacon on the hill for the world to look toward for salvation. Herein lays the pompous nature of Washington. 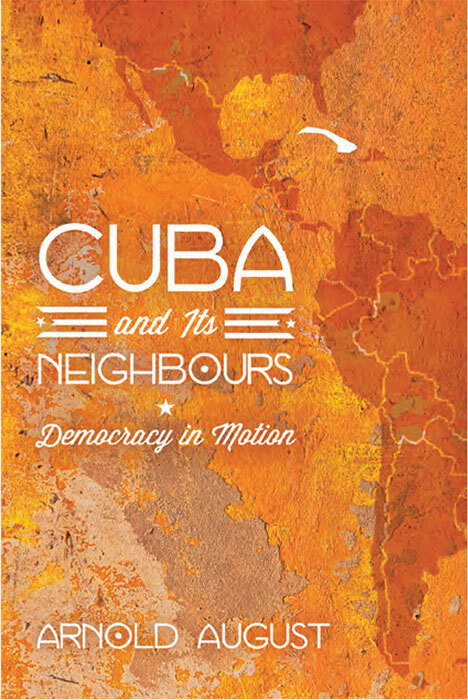 It can only be smashed in Venezuela through the channels of daily participatory democracy fashioned by the Bolivarian Revolution; it is striving to do so at this time in the most difficult circumstances after the December 6, 2015 serious electoral defeat. One must also add that the solidarity of other countries and peoples, especially in Latin America and the Caribbean, but also the world, is a key ingredient. The “election coups” make the situation all the more complex and dangerous.